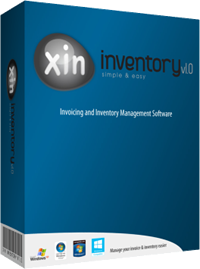 Xin Inventory 1.0 software is as simple and as easy to use as Xin Invoice 3.0. It is an all-in-one solution suitable to small or medium company which need Stock Control System. Xin Inventory 1.0 is an enhanced version of Xin Invoice 3.0, it contains all features from Xin Invoice 3.0, plus other features such as Stock Control, Purchse Order, Paypal Integration, Customizable Input Form, Price Level and many more. You can now never worry about loosing track on your stock. Your stock quantity will be increase/decrease accurately when you generate your Inoice / Receipt and Purchase Order / Receiving. You can also set a re-order point to each of your Inventory and you will be alerted when your stock quantity is low. Besides Customizable Template feature, now in Xin Inventory 1.0 you can even custom made your input form by addition additional 5 columns. It definitely a good news to busineses which having some special information that is not available in the existing standard program. You can easily include a Paypal button to your Invoice template. It allows your customer to make online payment easily and faster by clicking on the Paypal button. In Xin Inventory 1.0 software you can export your Quotation / Invoice / Delivery Note / Credit Note /Purchase Order / Inventory / Customer / Vendor / Sales Person data to Excel file. With these data exported in Excel file, you can import any necessary information to other system easily, Also, it allows you to create any report which is not available in the current system. To make a complete Stock Control circle, Purchase Order & Receiving is available in Xin Inventory 1.0. Just like other modules (Quotation / Invoice), Purchase Order can be easily converted or duplicated. Some businesses require more than 2 decimal place and this can be handled now in Xin Inventory 1.0 software. You can set 1-4 decimal place for Currency, Quantity and Percentage. Compared to Xin Invoice 3.0 which can support 3 Tax Code only, you can create up to 5 different Tax Code in Xin Inventory software. Unlike Xin Invoice 3.0 which the Tax Code is tied to Inventory only, in Xin Inventory 1.0 you can choose either to tied the Tax Code to Inventory or individual Customer. Also, there is an option to add additional tax amount to the overall transaction amount. "Xin Inventory has completely changed the way I used to handle my sales and purchase. It is the best sales software. I love its interface which is easy to use and compact. The reports feature is very useful feature. Its like a mini ERP. Love it	"
"So far Xin Inventory has come closest to being the inventory software that I want for my manufacturing business, most are not well suited to the changes and variations of inventory and daily running but Xin Inventory has so far worked out well."